While the term ‘commons’ has been in use for centuries in one context or another, the ‘global commons’ is a recent construct signifying the total inheritance of humankind upon which life depends. This includes more than natural resources such as forests, oceans and air. It encompasses our intellectual and cultural heritage—for instance, literature, art and the Internet. Seen in this light, our participation in the global commons is fundamental to being human.More primary than our many societal roles—whether we recognize it or not—we are all commoners. For simplicity sake, one can think of the commons in terms of both levels and types. Levels connote the scope of impact or activity. For instance, there are commons on the local, regional and world levels. Types include the domains of matter (physiosphere), life (biosphere) and mind (noosphere). Examples are noted in the figure below. These examples reflect resources that need to be collectively managed and responsibly stewarded for both current users and succeeding generations. 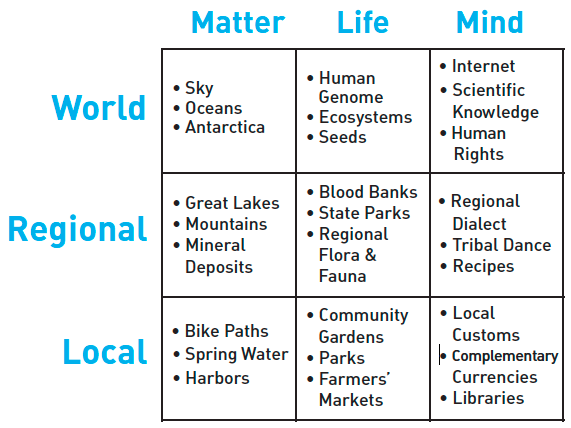 In addition to individual or particular commons, the entire chart suggests vital interdependencies, as well as the deep interrelatedness between the human family and the planet with its myriad species and biosystems. What makes the commons come alive are human relationships—the dynamic interactions of people working together to address shared needs. e nature of cooperation is such that it invites participation into a larger, more vibrant pattern of living. Such an understanding engenders a spirit of undeniable mutuality, a growing sense of trust among people, and a healthy respect for the earth and its abundance. The Commons: Tragedy or Comedy? In 1968, professor Garrett Hardin published his now-famous “Tragedy of the Commons” article in Science magazine. Using a hypothetical example, Hardin theorized that people acting independently and rationally would tend to deplete common assets or shared resources while trying to maximize personal gains. The example he offered was that of herders allowing their sheep to overgraze in a common pasture. The result is that the pasture eventually erodes and wilts while sheep and herders are left to search for other meadows. Nobel Prize winner Elinor Ostrom, economist Daniel Bromley, and other noted researchers have pointed out that while mismanagement can indeed lead to resource depletion, exhaustion of the commons is not inevitable. In fact, there are many examples throughout history of people successfully cooperating to manage commonly shared resources such as fisheries, irrigation water and pastures. In some cases sustainable arrangements have lasted for centuries. There is much we can learn today from the lessons of yesterday. Unfortunately, the commons is now under threat as never before. To understand why, let’s take a look at how modern life is organized. Conventionally speaking, we tend to refer to the private sector and the public sector as the main organizing units of human affairs. In some societies there are other institutions or groupings that play a prominent role, such as the church, the military or civil society. But, by and large—at least in liberal democracies— the private and public sectors predominate. Sometimes these are seen as complementary, sometimes one is more prevalent than the other, and sometimes both are in collusion with each other. In recent times, the private sector has rivaled the power of the public sector. Last year the largest multinational corporation on the Fortune Global 500, Wal-Mart, had annual revenues exceeding $408 billion dollars. If compared to national GDPs, Wal- Mart’s ‘economy’ would have placed twenty-seventh—ahead of Austria, Argentina, South Africa and 154 other countries. In addition to the sheer economic power of corporations, the private sector has developed a lobbying engine that greatly influences the formulation of public policy. In 2009, the public sector reasserted itself with great neo-Keynesian force. In the US, the bailouts of banks, AIG, Freddy and Fanny, and General Motors added trillions of dollars of liabilities to the government’s balance sheet. Elsewhere around the globe, troubled banks cried out to their home countries for help. Now, legislators in developed nations are implementing all manner of regulations in an effort to ensure that their major financial institutions never get sick again. The leaders of the G-20 have attempted to reassure us that this crisis is over and we can restart the engines of growth. However, the failure of the Copenhagen talks in December 2009 highlighted the limits of both nation-states and corporations to adequately address not only climate change but global issues in general. Every nation-state represented at Copenhagen viewed the meeting agenda through the lens of limited self-interest: country first, earthkind second. Every multinational, publicly traded corporation lobbying at Copenhagen was duty bound to a similar logic: shareholders first, earthkind second. In the midst of this state of affairs there is a third set of interests that must be represented—the global commons. In fact, the commons represents the vast array of assets that enable the private and public sectors to create value in the first place. Amazing as it may seem, the interests of the earth as a totality have not been represented. The time has come for the inclusion of the commons in our collective dialogue, not only on the issue of climate change, but more broadly, on creating a world that works for everyone. If the commons is so pervasive, why is it not a conscious and prominent feature of our life and work? In point of fact, the concept of the commons was legally protected by the Romans who differentiated between private (res privatae), public (res publicae), and common interests (res communes). The law of nature, published in 533 AD as part of the Code of Justinian, stated, “The law of nature is that which she has taught all animals; a law not peculiar to the human race, but shared by all living creatures, whether denizens of the air, the dry land, or the sea.” In England, two years after King John signed the Magna Carta in 1215, the Charter of the Forest (Carta de Foresta) was sealed by his son, King Henry III. It acknowledged the royal forests as common land that could be enjoyed and used by all citizens including serfs and vassals. This charter maintained statutory force for over 750 years until it was superseded by a new law in 1971. These documents became historical landmarks in establishing rights and roles relating to the commons. Unfortunately, however, even prior to the Industrial Revolution the commons in the United Kingdom were being privatized or ‘enclosed’ for the benefit of the few and to the detriment of the many. Author David Bollier reports that by 1876, after some 4000 acts of Parliament, less than 1% of the population owned over 98% of the agricultural land in England and Wales. Today we face an unprecedented worldwide situation where the private sector is drilling for oil in the oceans, releasing vast amounts of carbon into the atmosphere, patenting the genes necessary to cure cancer, privatizing water, claiming seeds as intellectual property and restricting network neutrality. Its long reach now penetrates segments of society previously considered off-limits to commercial interests. This includes public education, scientific research, philanthropy, art, prisons, roads, bridges and so on. In an interdependent world the issue is not whether one sector will replace the others—all are needed, the private sector, the public sector and the commons. The issue, rather, is one of establishing and implementing the principles necessary to create a truly sustainable planet. Environmental scientists tell us that the ecological footprint of the earth now stands at 1.4 planets in order to generate the resources we need and to absorb our wastes. This means that it takes the earth a year and five months to regenerate what we use in a year. With the increasing depletion of natural resources, potable water, clean air, and plant and animal species, there needs to be a new equilibrium, a rebalancing of human affairs. While the commons has a cornucopia of natural and cultural resources, the private sector has financial resources and often political resources at its disposal. It is true that some corporate executives publicly express concern about the environment and many use multi-dimensional scorecards. 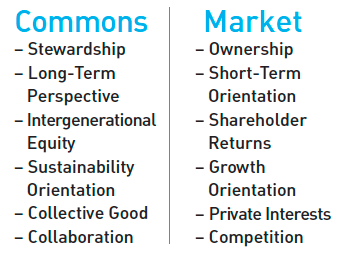 Several boards are endorsing sustainability statements, shareholder groups are more actively taking ‘green’ positions, and rating agencies are increasingly scrutinizing commitments to social responsibility.However, it is essential to acknowledge that the commons and the private sector are driven by fundamentally different propositions, as noted in the diagram. In recent times there has been no voice for the commons and a very loud voice for the private sector. Regrettably, shortterm thinking now dominates not only corporations but elected officials and popular culture as well. The exigency of the times calls for a shift beyond limited and limiting perspectives. We owe future generations the right to live in a livable world—even as we approach 9 billion people by mid-century. By bringing the commons to the foreground, we have the conceptual framework for a new narrative. 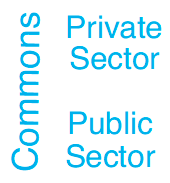 Implicit in this narrative is the seniority of the commons with respect to both the private and public sectors. The commons is the fundamental store of intrinsic value that precedes human organizational forms, such as nation-states and corporations. This understanding requires the emergence of new institutions, new forms of governance, and new sets of principles that address, for instance, issues of governance, property rights, monetary systems and human security. Who says that ordinary people can’t take charge of the commons on which they depend for life? Is it only nation-states who can make laws and set policy on how property and resources are used? Nobel Peace Prize winner Dr. Bernard Lown recently said, “Policy is too important to be le to experts. Policy must be decided by the people.” Taking responsibility for the commons at a local, regional or world level inevitably involves issues of rights. Throughout much of recorded human history the fate of commoners or ordinary people was often determined by pharaohs, emperors, kings and queens. Beginning in the late seventeenth century, particularly with the Peace of Westphalia, the nation-state model began to emerge with monarchs reluctantly sharing power with elites. An evolutionary leap occurred in 1787 with the ratification of the US Constitution. In particular, the Ninth Amendment specifies: “The enumeration in the Constitution, of certain rights, shall not be construed to deny or disparage others retained by the people.” Legal scholars generally agree that the Ninth Amendment itself is not a source of rights per se. Rather, as some contend, it refers to latent rights not yet articulated and enacted. With respect to the commons, an unfolding issue in the years ahead will be making such latent rights manifest. In 1948, the General Assembly of the United Nations approved and endorsed the Universal Declaration of Human Rights that stated: “Everyone has the right to life, liberty, and security of person.” Such a right exists, the Declaration states, regardless of “…country or territory to which a person belongs, whether it be independent, trust, non-self-governing or under any other limitation of sovereignty.” In an era of catastrophic environmental degradation it is clear that “life, liberty, and security of person” cannot be guaranteed without a fully functioning and healthy commons. Presently there may be legal, political, and even military obstacles to creating widespread governance structures for the commons, but new and innovative approaches are emerging. And the senior ethical and moral principle is clear—the people are responsible for the commons. Last spring I taught a course to Executive MBA students called “Emerging Trends in Business and Society.” The commons was featured prominently. One student, a hedge-fund manager, described a heartfelt dilemma.He grew up in the Midwest, and during the summer his family would vacation on the Wabash River. He loves the Wabash and all that it represents. Now in his forties, he vacations with his children on the river. He was distressed by the fact that an upstream chemical company (private sector) is polluting the river, and the state department of natural resources (public sector) is not adequately enforcing environmental regulations. He expressed concerns about whether the river would still be healthy for his grandchildren. He came to understand that the Wabash River is a commons and that structures must be developed to protect it as such. All parties who use it must take into account what the Wabash requires—all 475 miles of it. Yes, we are all commoners. Prior to the divisions imposed by human invention, whether by tribal association, class, caste, religion, nationality or any other limited identity, the commons manifests as an infinitely rich network of natural and human ecosystems that are, in reality, a seamless whole. To live on this basis, even presumptively, shifts both individual and collective decision- making processes from parochial self-interest to responsibility for the totality. And a whole new world comes into view.